On June 27th, the Humanitarian News Research Network (HNRN) will be hosting Kate Wright’s book launch. Who’s Reporting Africa Now? Non-Governmental Organizations, Journalists, and Multimedia is published by Peter Lang and focuses on the delicate and increasingly symbiotic relationship between media organisations suffering foreign news budget cuts and Non-Governmental Organisations (NGOs) in terms of content production. We had an insightful Q&A with Kate to give you a sneak peek on what you can expect from the book and the event. HNRN: Do you think NGOs’ involvement in news generation is positive? What are the pros and cons of NGOs getting involved in content creation? Kate Wright: On the whole I think the effects of NGOs getting involved in news production lean towards the negative at the minute. I did find some positive effects, most of which pertained to the roles which rights-based organisations played within long-forms and investigative journalism – where they helped to disprove lies, and produce complex explanations of the causes of suffering. But NGOs make an awful lot of normative claims about their media work which simply don’t stand up, for example, the idea that NGOs’ involvement in news-making “gives voice” to the marginalised by helping them “tell their own stories”. It’s nonsense. The ways in which local people are approached to ask for their participation means that what they can say is very tightly circumscribed, ideas of “value for money” can mean that those interviews are rushed, and few understand what they are actually they are consenting to. Finally, NGOs tend to have very little idea about what is involved in oral interpretation; so they wouldn’t know how to “give voice” to those speaking in another language even if this was a priority for them – which it isn’t. HNRN: What are the dangers of using NGO content during ‘quiet’ weeks? KW: If NGO content just supplemented many other kinds of African coverage, I wouldn’t have as much of a problem with it – and the weird thing is many NGO workers are also uncomfortable with their own dominance in African news too. The issue, as I see it, is that on quiet weeks, cuts to news budgets means that very little original material is being commissioned by news desks. So the coverage of sub-Saharan Africa can easily end up being dominated by NGO content, which is technically and aesthetically very polished. That’s a problem because NGOs, understandably, have their own agendas: be that gaining political legitimacy, raising money, or exerting influence on policy-makers. So what happens to all those stories, issues and actors which are important to African countries, but which don’t fit with NGOs’ organisational agendas? Who gets to describe what’s happening, to whom and why it is important? These are old critical questions about framing – but they are still important ones. 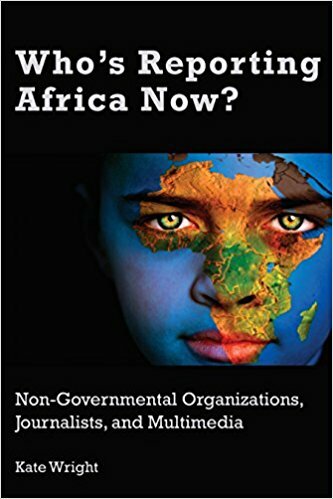 What this book shows is that NGOs are not just vital in framing “Africa” during famines and other joint fundraising appeals, they’re also vital in other kinds of news-making periods. So what does that mean for the kinds of knowledge constructed through international news? It’s pretty limited and lop-sided, isn’t it? HNRN: How have the cut in foreign news budget influenced journalists’ understanding of their professions? KW: I don’t think it has been the cuts in news budgets alone which have influenced journalists’ understandings of what ‘good’ or appropriate journalistic practice is – nor has this, in itself, altered their role-perceptions. Instead what I saw was journalists trying to hang on to old ideals which they could not longer – to be blunt – afford to uphold. In some senses, this is why they have turned to NGOs, which are now the bastions of the geographic and media-based specialism, driven out of mainstream news outlets. But in the course of drawing on that specialism – which is often mediated through freelancers who work for both NGOs and news outlets – journalists tended to alter their views of ‘good’ journalism. The model I use here has been developed from moral economy theory, which examines how economic exchanges (such as journalists’ use of NGO material) are embedded in ideas of what is good, right or fair. In the course of justifying new kinds of exchanges, actors tend to bring about the interaction of economic values (such as cost-cutting) and normative values (including ideas of morality, political progressiveness and professionalism). These interactions are shaped by their various different responsibilities, which might include statutory obligations, such as those shaping work at the BBC, and other informal notions of responsibility to others. What you get as a result of these exchanges, over time, are some quite pronounced changes, with journalists and NGO-workers blending their ideas of what they are doing and why, in complementary ways. So what you usually find is that news organisations tend to prefer to work with similar kinds of NGOs over and over again, and vice versa. That’s what’s behind the ‘favouritism’ you may have heard about at the Frontline Club. Social links, cultural similarities and geographic proximity all matter, but there are much deeper, normative shifts going on as well. So, for example, you end up with Channel 4 journalists arguing that public service journalism includes human rights reporting (despite some tricky questions about impartiality). Whilst their partners, Human Rights Watch argue that they produce ‘proper journalism’, which is not driven by the norms of commercial populism, so it has a public purpose. See the dovetailing going on there? HNRN: Should journalists disclose the use of NGO material more openly? How and why should they do so? KW: Nearly half of the items I found did not state clearly that they contained NGO material. Sometimes this was a mistake, made by increasingly time-poor journalists under pressure, close to a deadline, and sometimes it was felt not to be needed because the material had come via social media or from a freelancer. Occasionally, the latter was felt to be an advantageous circumstance, as journalists didn’t really want to admit that the material wasn’t theirs, because they felt it would lower the credibility of their work in the eyes of their audience. But that’s really unacceptable: if an NGO has commissioned or carried out multimedia production they deserve credit for that. The audience also needs to know who is behind a particular piece of journalism, so they can scrutinise its claims. This is particularly important when you get freelancers re-pitching the same material they produced for an NGO donor report to a news outlet. A donor report is always going to be about how great a project was, so using that material again, as part of a seemingly ‘critical’ piece of journalism, without warning audiences where the material came from – well, it’s really not ok, is it? HNRN: What concepts would you like your readers to remember from the book? KW: I think I would really like to stress is that this book disproves that the problem is “churnalism” – journalists’ rapidly reversioning large volumes of contributed material, without really thinking about it. That model doesn’t really work with NGO material for two reasons. First, NGOs can have a really big influence over how journalists perceive a certain period of time even when journalists use very little NGO material in very long news production processes, involving many different sources. So quantitative methods don’t really help you understand the nature of NGO influence. Second, journalists think about their uses of NGO multimedia – and try to legitimise it – a lot. This means that they aren’t the passive churnalists Davis described, but it does creates the new problem I have described above. That is: in seeking to justify their uses of NGO content, journalists tend to alter their understandings of what ‘good’ journalism is and what it is for. What I am trying to say here is that it’s not just about NGOs getting to frame an external situation, as Suzanne Franks has discussed in relation to the Ethiopian famine of 1984. It’s about journalists re/framing their understanding of what it means to do ‘good’ journalism at their particular outlet. That’s what is at the bottom of this “trust” which we have all been trying to understand, and its effects are really noticeable even when journalists and NGO-workers fall out with one another spectacularly. So maybe ‘trust’ was too blunt and imprecise a term anyway. The idea of journalists’ partial disembedding from the field of journalism, and re-embedding in value-laden exchange networks with NGOs, works much better. HNRN: Now that the book has been published, what are you working on? KW: I’ve just got back from the International Communication Association conference in Prague, where Mel Bunce, Martin Scott and I had a paper on our new project – an AHRC funded study of Humanitarian Journalism. I’m going through nearly 200 interview transcripts now, and it’s quite a job! But it is a fascinating one – I’m currently working on comparing different modes of state-funded journalism, looking at Chinese state media, Al Jazeera, BBC World Service and Voice of America. But we’ve also got some really interesting research going on into foundation-funded news outlets, some of which is out already. We will be collecting the best tweets and questions from the event into a new blog post, so come along and tweet away for a chance to be featured on our blog! Digital humanitarians: a new source for crisis reporting?